Lovely, isn't it? Three letters, and she even managed to get one of them right. Good job! One of the mistakes is the same one that brought to the downfall of Wise Guy from previous post, with the Hebrew letters Tav and Het which are somewhat similar to each other. The other mistake, however, is far stranger. 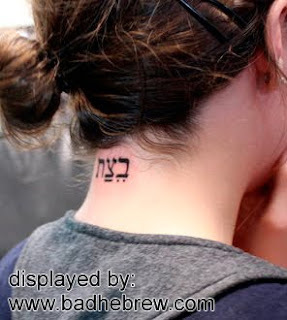 The Hebrew letters Bet and Nun look nothing alike! Remember boys and girls, when mapping your Hebrew letters from a picture - it's important to get an exact match. Kinda-sorta matching is not good enough when your skin is on line! They got the vowels wrong too. How'd they do that? This one is genius! I would totally get a Kinder surprise tattoo.